LOFT is an American designer clothing store for women. The designer clothing offered consists of a wide array collection of high-end styles. The feminine and casual style includes everything from pants to dresses to accessories that are perfect for any season. With Big Apple Buddy’s personal shopping service, you can now buy direct from the LOFT online store anytime, anywhere. 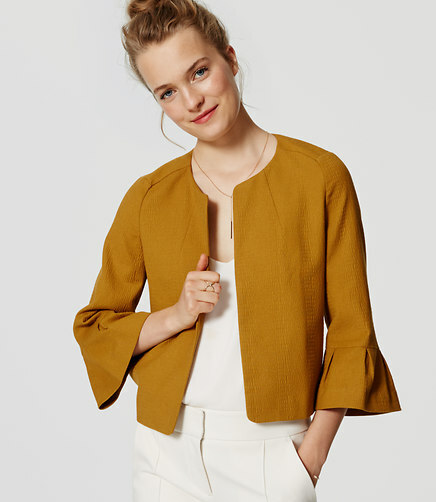 Stay chic with the LOFT Lantern Sleeve Jacket! This business casual jacket is perfect to show off what you're wearing underneath, whether it's a blouse or dress, and still be covered up. The snakeskin inspired texture of the jacket makes it stand out and remain comfortable enough that you won't want to take it off. The neutral colors allow you to combine with anything and stay in style no matter the season. Looking for the best new dress for the summer? The LOFT Lace Flare Dress is one of the hottest styles of the collection. With a cut fit, this dress accentuates your body but is never too tight so you can stay comfortable. The intricate design of the dress seamlessly blends but also makes you stand out in the best way. The simple flow is ideal for the summer time and works as a casual or a business outfit. If you're looking for a more casual option, the LOFT Chambray Drawstring Romper could be the ideal choice. The rompers are back in fashion! Don't miss out on one of the most popular options for the summer season. With a casual and breathable feel, the romper will stay light and comfortable throughout. The chic style is perfect for any occasion while allowing you to dress up with any alternative. Unfortunately, the USA LOFT online store does not currently offer international shipping. However, Big Apple Buddy, your personal shopper, can help you buy products direct from the official USA LOFT online store and ship them to your doorstep, no matter where you are in the world. We offer international shipping to over 190 countries including Australia, Austria, Bahrain, Belgium, Bosnia & Herzegovnia, Brazil, Brunei, Canada, China, Croatia, Cyprus, Denmark, Estonia, Finland, France, Germany, Hong Kong, Hungary, India, Indonesia, Ireland, Israel, Italy, Japan, Kenya, Kuwait, Lithuania, Macau, Malaysia, Maldives, Mexico, Namibia, Netherlands, New Zealand, Norway, Oman, Pakistan, Portugal, Saudi Arabia, Scotland, Serbia, Singapore, Slovenia, South Africa, South Korea, Spain, Sri Lanka, Sweden, Switzerland, Taiwan, Tanzania, Thailand, UAE, UK and Ukraine. If you would like to buy from the USA LOFT online store, simply let us know which items you would like to order (by filling out the form on the right) and we’ll get back to you with a free international shipping quote within 24 hours!